FN 5.7x28mm ammo was created 1990 by Fabrique Nationale d’Herstal (FN) in a bid to replace the 9x19mm parabellum for NATO use. The centerfired cartridge features a rimless bottleneck design and utilizes a 5.7mm (.224”) projectile. With a total cartridge weight of roughly 93 grains, the FN 5.7x28mm weighs about half as much as 9x19mm parabellum, and produces 30% less recoil. The round’s flat trajectory allows for an effective range of 200 meters from a PDW and 50 meters from a pistol with a maximum range of over 1,500 meters from either platform. Commercially, the FN 5.7x28 is available in several varieties. SS195LF lead-free hollow-points deliver velocities over 2,300 feet per second, generate over 340 foot pounds of energy and are completely lead-free (even the primers contain no lead to vaporize), making them ideal for use at indoor ranges. 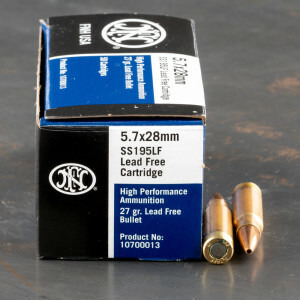 AE5728A total metal jackets (TMJ) utilize a 40 grain lead bullet, completely surrounded in copper, to produce over 320 foot pounds of energy at 1900 fps. 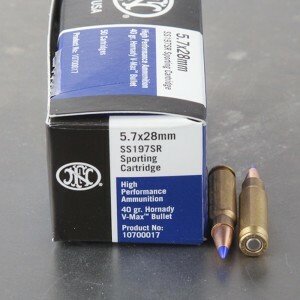 Finally, the SS197SR sporting round propels a blue polymer-tipped Hornady V-Max bullet at 1950 fps. With a proven, expanding bullet design and 340 foot pounds of energy, the 5.7x28mm sporting round is the all-around choice for hunting and personal defense. What Caliber is the FN 5.7x28mm? The FN 5.7x28mm has a bullet diameter of .224 inches. Although it is primarily a handgun cartridge, the bullet size places it near the same diameter as famous cartridges like the .22 Long Rifle and .223 Remington. One of the closest cartridges is the .22 WMR, but for handgun cartridges, the .25 Auto is probably the closest, at least when it comes to diameter. However, it absolutely surpasses the .25 Auto when comparing velocity. What is the “FN” For? The FN in its name stands for “Fabrique Nationale,” as in Fabrique Nationale Herstal (National Factory of Herstal), a Belgian firearms manufacturer. This company, at the request of NATO, created the cartridge to give soldiers greater range, accuracy, and terminal performance in their service sidearms. With a higher velocity, the goal was to create a handgun round that could penetrate enemy body armor and other barriers. What is the Purpose of the “Bottleneck” Design? Aerodynamics. The bottleneck design of the bullet allows for greater air resistance. This is why the FN 5.7x28mm is a popular round for long-distance handgun target shooting. Combined with muzzle velocities around 2,000 feet per second and relatively light bullets, the FN 5.7x28mm has one of the straightest trajectories among all handgun cartridges. How Does the FN 5.7x28mm Compare to the 5.56x45mm (.223 Winchester)? Although these are different cartridges with different purposes, the similar bullet diameter means they are often compared. The .223 Winchester, however, is far more popular for rifles, and has become one of the leading high-velocity target-shooting rounds. The FN 5.7x28mm is much shorter in overall length, carries generally smaller bullets, and does not reach the high velocities of the .223 Remington, which commonly passes 3,000 feet per second. How Does the FN 5.7x28mm Compare to the .25 ACP? The FN 5.7x28mm is a much faster and powerful cartridge than the .25 ACP. They both use bullets of about the same size, but the FN 5.7x28mm has velocities reaching above 2,000 feet per second, while the .25 ACP is usually about 750 to 900 feet per second, which gives the FN product far straighter long-range trajectories. Pistols. This cartridge was designed mainly for semiautomatic pistols that were used by NATO soldiers. There are some rifles that shoot this cartridge, but they are fairly rare. Is the FN 5.7x28mm Enough for Self Defense? Considering that the FN 5.7x28mm was created for NATO soldiers, the answer would seem to be “yes.” However, the cartridge was meant to deliver penetration of armor with high velocities, which is something the average concealed-carry user does not need. Another goal was to allow soldiers to use their pistol against enemies at greater distances; personal protection rarely, if ever, calls for long-distance shots.